Wanting an in-ear headset without the extravagant prices commanded by commercial vendors, I decided to roll my own. Total cost was $70 ($50 for the Comply headset, $10 for the Shure inline volume controller, $10 for heatshrink, Radio Shack project box. I contributed the mic and plugs from a gutted AvComm PNR cupped headset). I tested the set yesterday in the air, and it worked well. ATC said sound quality was fine (with a tone to stop bugging them after the third radio check). Noise attenuation of the Comply foam tips was a little better than my PNR cupped sets (QFC) - I'll try to borrow an ANR set to compare. Comfort was far better - flew 1.5 hours, didn't notice set or earpieces. I roughly followed the links below, but as with Pete Howell, I just used the Shure volume controller and did not use any transformers, pots. Made things real easy. This is the completed set. I tried two earbuds - the Shure E2C @$65 (better sound quality for music) and the Comply set @ $50 (very comfortable tips, a little better sound blocking). Also note the Shure inline volume controller lower left - that plugs into box, then headset into that. Of note, I wanted a separate jack so I can take the headset away and use it for the mp3 player, etc. Here is the in vivo pic - I'm using the Shure ear buds, but used the Comply ones mostly inflight. Frame - To make the wire frame, I used some wire from a leftover Van's piano hinge. I made a prototype wire with a coat hanger, shaped for a bit until it felt comfortable - don't forget to move your head in all directions to ensure the set and mic stay in place. I then bent the hinge wire to the shape of the coat hanger template - these two steps alone took an hour. The trick with the latter is to try and 'roll' bends and not get kinks. After wire hookups, heatshrink was applied for a more finished look. On my next set, I will try and keep the mic wires running along one side of the frame wire with epoxy before heatshrinking to provide a more polished look. In the pic, the mic was just sitting here. I did not trim down the original AvComm mic, but others have. Weight was irrelevant, so I will do same next time. Plus, muff fit better on bigger mic body, and there was no time spent floxing a new body. Here is the box - original headset wires from plugs come in, re-attached mic circuit chip (used to be in head cup) to appropriate wires, ran earphone wires to 1/8" stereo jack. On the latter, the planes I fly are mono intercoms, so I put a jumper between the right and left channel jack terminals - I will change this later when the RV is done, as I intend on a stereo set up. For the mic wires from the box to the mic, I used a piece of 2 conductor RCA patch cord from the scrap bin. Cord entries to the box were protected with strain relievers from the original headset. A little epoxy ensured no slippage. That's about it. Works well, was cheap, and only was about 5 hours of work. Last edited by cnpeters : 08-27-2007 at 10:05 PM. Cool project, and thanks for letting me know about the the Shure inline volume controller...I was working on an audio project this week (putting sat. radio on my motorcycle through an intercom system) and was wondering if there was a a simple way to ad an inline volume control. Thanks! wondering if there was a a simple way to ad an inline volume control. Thanks! The newer NR10 Comply earplugs supposedly have more noise reduction and come witn an in-line volume control, for $60. I went out to the hangar yesterday and found a 10 year old stereo headset that was replaced by a newer model long ago. I felt like a kid again riping it apart. I salvaged the rubber grommets and the volume control and drew out a schematic of the original wiring before taking the electrical harness apart. I went to Fry's electronics and bought some long heat shrink rubber tubing and nothing else, mainly because they didn't have any of the other stuff I was looking for! Unbelieveable! Next stop, Radio Shack. They have it all. I bought a Project Box. A 1/8" Stereo Panel Mount Jack. A bag of assorted Grommets. 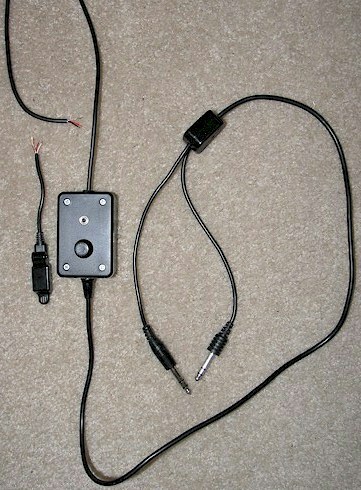 And a 6 foot stereo cable with two plastic coated wires and a shield for the mike. I also picked a really cheap circuit tester to make sure I made the connection (arr-arr). I am going today to Target to get these battery powered noise cancellation earphones. I have a friend who rides Harleys and swears by them. Last edited by SmittysRV : 08-30-2007 at 06:37 AM. This looks like a great project and that all the real thinking is already done! Think I'll build a set to go along with the QT Halo's I bought at OSH. No use having my lovely co-pilot wearing those old Sennheiser ANR's. One question, however. Wouldn't it have been simpler to just put a 1/4" to mini plug adapter into the headset output and plug the earpieces in there? I have a couple of those, both stereo and mono. I don't know if Radio Shack handles them anymore, but I think I bought them there. I don't know if there is a .206 adapter or not. Also, if we are heading that direction, why not wire up the panel with mini outputs/inputs instead of the 1/4" and .206" plugs that go back to the days when we hand-cranked our phones? I talked to the proprietor at QT about this and it makes no sense to use such old technology today. IMHO, anyway. Thoughts? Makes perfect sense - like the idea. The project box was originally done as per the links I posted since extra parts were added (tranformers, etc). I just copied the same idea, but didn't need to add any electronics for the mic circuit. I may do your idea if I can find the adapters. Also, putting in the 1/8th jack on your panel (or desired place) makes sense - will probably put both conventional and this jack in, so can switch headsets around if desired. Last edited by cnpeters : 08-31-2007 at 07:57 AM. Could you use something like this for the mic? Might be quieter and get rid of the around the neck microphone holder. Couple issues - I can not stand something gripping around my neck, and the reviews were less than flattering. Position issues brought up by at least 3 of the reviewers. Don't know the quality, but that whole set is only $30, so mic quality probably not great. You would have to do some research with it. At least by gutting an old headset, I knew exactly what I was getting into with the mic quality. Plus, my wire frame is really not noticed, even with extreme head turns, flexion and extension, since I took care to adjust the proto coat hanger first. If you decide to go this route, I would love to get your opinion after testing.